Please don’t show off your breasts tonight. Or do it, I personally don’t care… but don’t show your boobies to every man in the bar for 5 cent beads, then go crying to your best friend asking why no one respects you the next morning. If you really want to show off the girls, become a stripper and get paid at least a buck a pop! 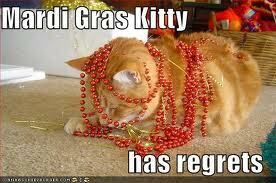 Happy Mardi Gras Everyone!!! I’m heading out to enjoy the debauchery of the evening. I’ll post pics later.